When people hear that I’m not Thai, but I’m American and that I usually cook Thai food five out of seven days a week (if it’s an awesome week) and my Thai food has gotten five star ratings not only from my Thai hubby, but my Thai mother-n-law, they think I must be a super talented Thai chef. 1. 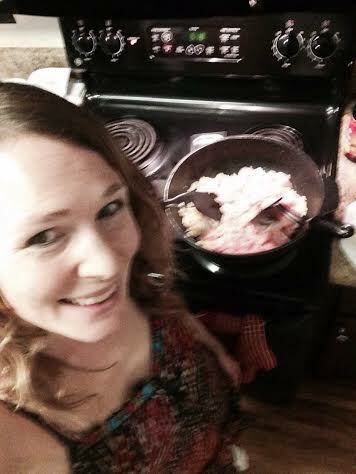 I didn’t grow up cooking or learning about how to cook Thai food, or anything really. My mom is an awesome baker and cake decorator. My heart still beats a little fast when I think of biting into one of her warm, salty, sweet old-fashioned muffins that my bro and I would call Chinese houses because for some reason we thought their dome shape looked like a Chinese house? And my lips can still taste the smooth, thick, brightly colored frosting she would expertly pipe on my chocolate birthday cake in the shape of a Schnauzer puppy holding a rainbow of balloons, per my request. She always said she cooked for us because she wanted to provide a meal for our family, but not because she really enjoyed it. So I liked baking growing up, but never thought much about cooking until I came back from Thailand and that was the only way I could have Thai food every day without going into debt by eating at our favorite Thai restaurants every single night. 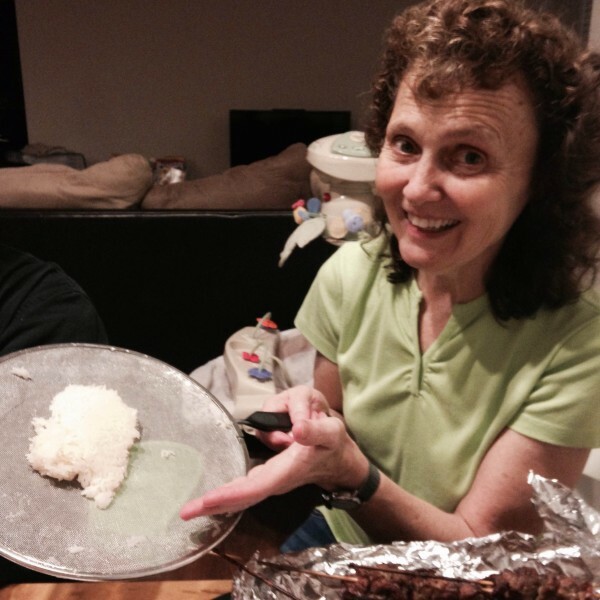 This is my sweet mom who made sticky rice by herself the last time she was here!! 2. I make a frenzied mess every time I cook. My Thai hubby is the type of person who values order and cleanliness and if he sees a pile of dishes start to tower in the sink or around the sink and on the counter, his blood pressure starts a rising. For me, I know that the mess is just a mess that will disappear in a few hours, so it’s no big deal if while I’m cracking an egg, egg whites splatter out of the shell and harden onto the stove, or if while chopping garlic a pile of peels spins off the counter onto the floor, or if while I’m scooping out rice it congeals to the front of the dishwasher somehow. I never let the mess stay long, for my hubby’s sanity, and usually he helps clean it up, but if you looked at me and my kitchen while I was cooking, you would wonder when the tornado would be leaving and how anything delicious could come of a disaster zone. 3. I mess up while cooking–a lot. One of my friends wanted to learn how to make my Thai Basil Meatballs with Thai Pesto Sauce, so after our kiddos were in bed I went to her house, and we had a cooking lesson/chatting about life girls’ night. We had already baked one pan of Thai Basil Meatballs when I realized I had forgotten to add a bit of sugar to the mix to balance the flavors, and while I was pouring some into the bowl holding the rest of the meat mixture, a huge waterfall of sugar came gushing out. “Oops! !” I said, while we both starting laughing uncontrollably, while trying to scoop out the hill of sugar. While I’m cooking, “Uh-oh!” is heard a lot in my kitchen, but I believe all these ‘Hmm..that probably wasn’t a good idea,” mess-ups that happen weekly are what I learn from to become better cook of Thai food. 4. I’m the world’s slowest at prepping food. I could never be on any Food Network competition show that you have to make an amazing dish in 20 minutes before the buzzer sounds because as soon as the buzzz sounded, I would have only just finished chopping my vegetables. I’m not that good at using knives, so it takes me ages to prep food. Or it could be my knives are never sharp. Or it’s a combo. My mouth always falls open whenever I watch chefs on the cooking shows chop things and move their hands a mile a minute without chopping their fingers like I always do. But I did recently take a Knife Skills Class at the Sustainable Food Center in Austin, which made me feel way more confident about my chopping, so hopefully very soon I will chop as fast as the awesome street food vendors in Bangkok do. 5. I adore Thai food. Some days I want to just eat a meat lovers pizza with extra sausage and garlic sauce, and other days I could eat breakfast tacos from our favorite Austin street vendor all day. But if I go a week without any Thai food, my tummy starts hurting, and I start getting bored of the non-Thai food I’m eating. It’s this love for Thai food that has made me want to learn how to cook it. It’s also why I keep going even after when I made tom yum, and it tasted like Pine-Sol because I left the lemongrass cooking in it all day, or even after I make something so spicy it’s inedible, and instead we eat rice with a fried egg for dinner. So even if you aren’t a pro at cooking like me, but you love Thai food and practice a lot, you can cook Thai food that would make my Thai hubby happy too! I also think Thai food is delicious! If you have a crock-pot and a rice-cooker, the food preparation isn’t very long. What’s your favorite dish? Im glad you enjoy it too Alex! 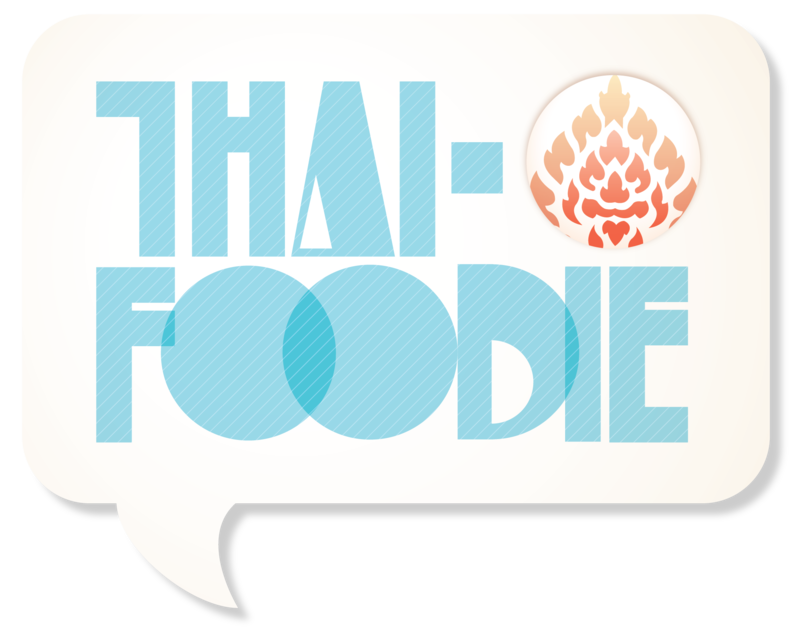 It’s hard to say what my favorite Thai dish is, it depends what mood I’m in really! Lately I’ve been in the mood for Thai noodle salads like yum woon sen! So refreshing for summer! 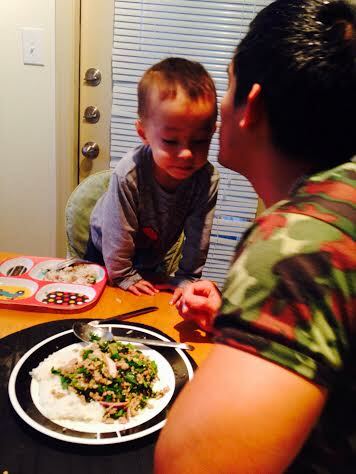 Please can we have your recipe for yum woon sen………my favorite! Most Thai restaurants only have pad won sen on the menu! 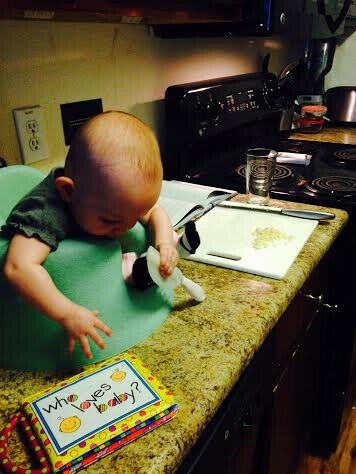 I’ve always had an interest in preparing Thai food. How do I get started? Thank you for your blog. Hi Linda! I think a great way to get started is to go to your Asian store and buy some of the essentials, like fish sauce, Thai soy sauces, tamarind paste and oyster sauce and then start trying different recipes! 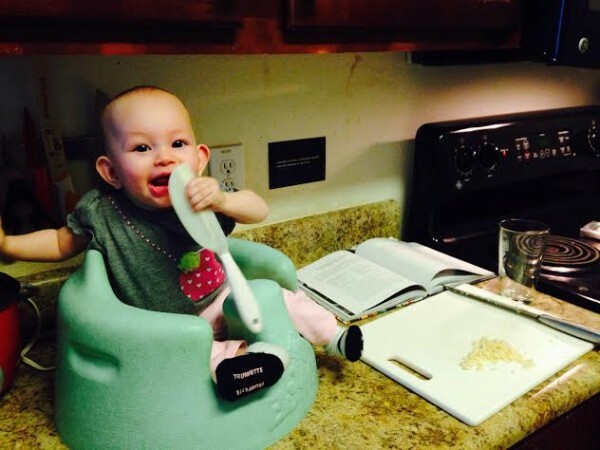 So excited that you want to get started!